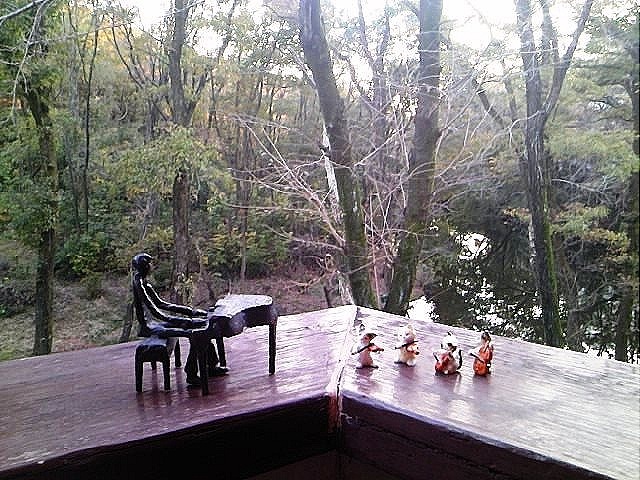 The 19th M&P’s Afternoon Tea Concert: violin and piano cocert with delisious tea and cake and cucumber sadwiches. “Welcome back!” The concert finished with Paul’s greeting and the afternoon tea party started. 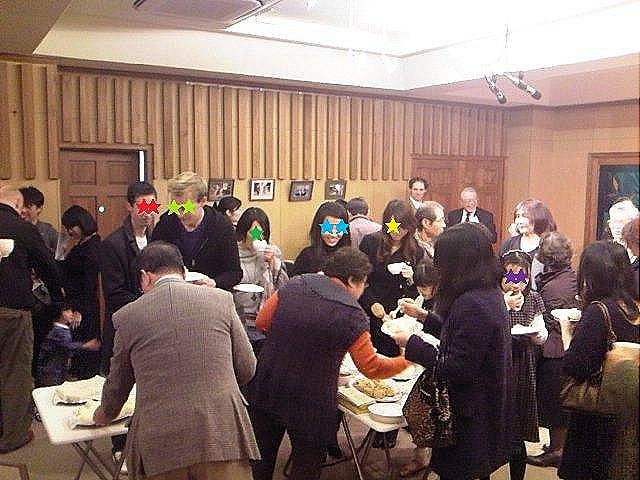 It was the 19th M&P’s Tea’s Afternoon Tea Concert at Yamano Hall in Nisshin on November 26th. The reason why Paul, the president of M&P’ Tea, said “Welcome back!” to audience was because the concert had been supposed to begin at 2:00 p.m. but it actually started two hours later. The cab driver drove me around 1:45 to the concert place. I began climbing up the steps outside to the entrance when a woman asked me, “Did you come here for the tea concert?” So, I replied, “Yes.” Then she said, “It seems they have a trouble. You should ask those people the situation over there.” I turned around and saw Paul and some people talking to a driver in a car on the road. Actually, I had made a reservation for a clinic at five. I had planned to go there after the concert. Yamano Hall is inconveniently located. So, I needed a cab for going back home or to the clinic from the place. I jumped in the backseat of the car and said, “Start the car, Driver. I haven’t known where I’m going yet.” The driver rolled his eyes because the costumer who had just got off the car got it on again. In the backseat, I was busy. I needed to change the reservation at the clinic and to cancel another taxi for return from the concert hall on the phone. I was about to call the clinic, my phone rang. It was a friend of mine. She also just knew what was happening to the concert. She was in the same situation and had been going to the dentist after the event. Luckily, I was able to change the reservation at the clinic and to go there right away. So, I directed the driver to head for Shiogamaguchi, saying “Do you know where Shiogamaguchi is?” The driver just came from Hokkaido. After all the fuss, I went back to the concert hall before 4 o’clock. 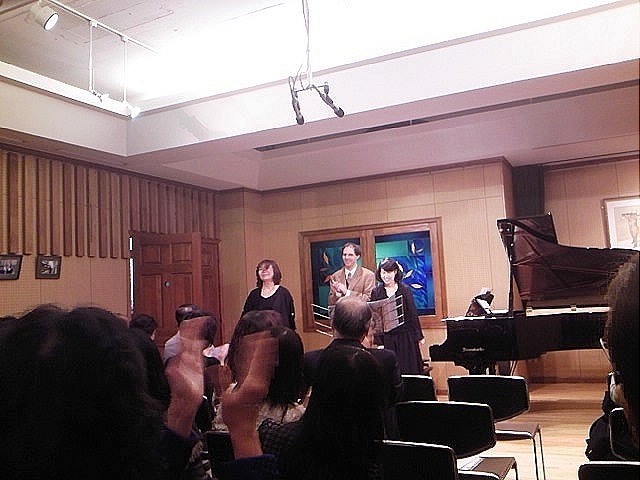 The concert was a violin and piano concerto. The violinist is Japanese but came from Switzerland that day. They played Prelude and Allegro, Fair Rosmarin, Love’s Sorrow (those three numbers were by Kreisler), Salut D’amour by Elgar, Dance Russe by Stravinsky, and Sonata for Piano and Violin in A major by Frank. Classical music is not my line, but I liked the powerful performance of the two players. I really enjoyed the concert. 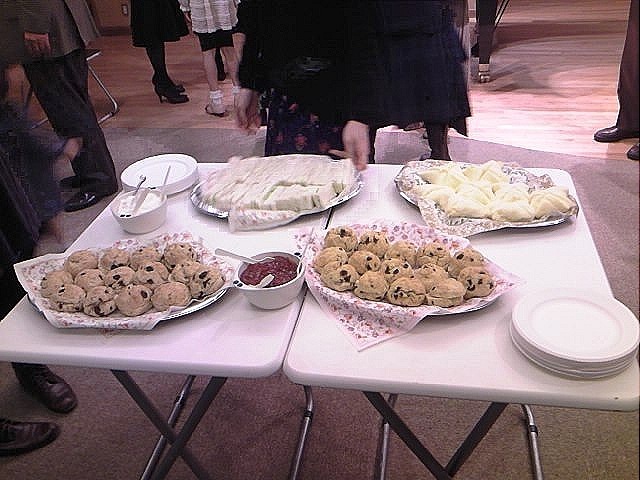 To the truth, my main purpose to be there was the afternoon tea party after the concert. I love Paul’s homemade cucumber sandwiches! I looked forward to having them with M&P’s Tea’s wonderful tea. 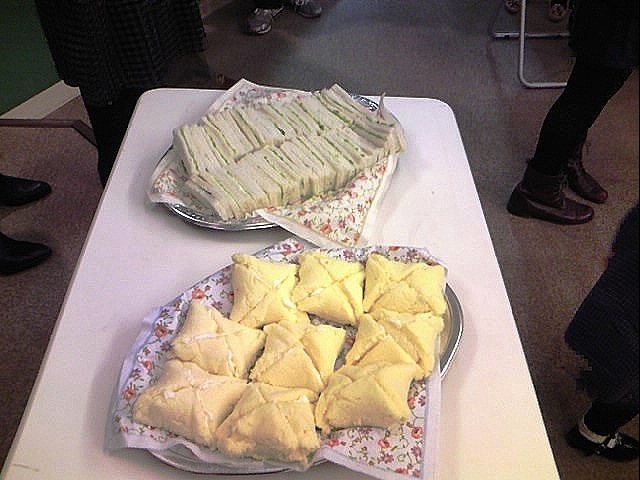 Scones with cream and jelly were also delicious. 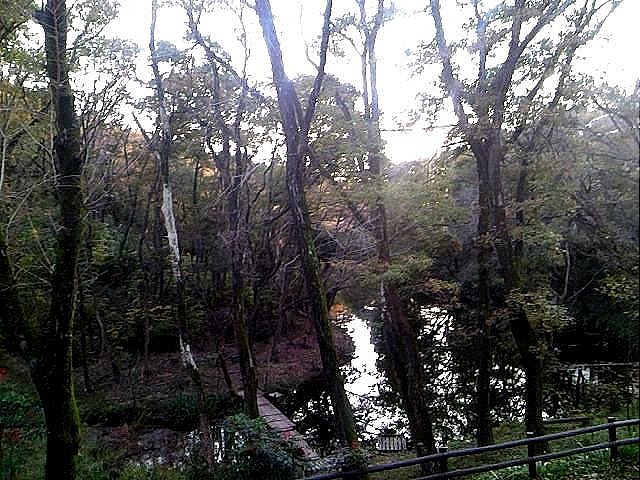 I saw some of my friends there and enjoyed talking to them over tea and cake. I had a really great time. I’m looking forward to the 20th anniversary concert soon! “I virtually killed them. If I hadn’t begun this project, these people wouldn’t have been dead…” It penetrated me when a professor at Nagoya University quoted a man named Shotaro Kuno. That was one of speeches for the ceremony for the 50th anniversary of Furokai at Nagoya Citizen Hall in Kanayama on November 15th. Actually, I hadn’t known the event was organized by the institute or anything about the group until the ceremony began. I went see Dr. Ryoichi Obitsu speak there. 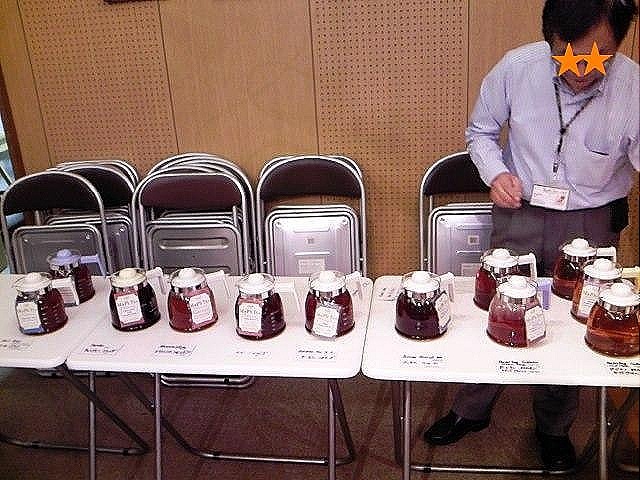 Dr. Obitsu is famous for an advocate for holistic medicine and a maverick from Japan’s medical world. One day I found an advertisement for the lecture on the newspaper and applied for it. On the article, his name was emphasized with his photo, but the organization name was just written with very small letters down there. I had seen the name of Furokai on the paper indeed, but I had had no idea about the group until I heard of speeches at the event. I’m going to write about the speech of Dr. Obitsu later, but first I’d like to introduce the organization. Furokai is a judicial foundation for body donation. It was established by Mr. Shotaro Kuno in 1962. He was the originator of developing Aichi Irrigation Canal. 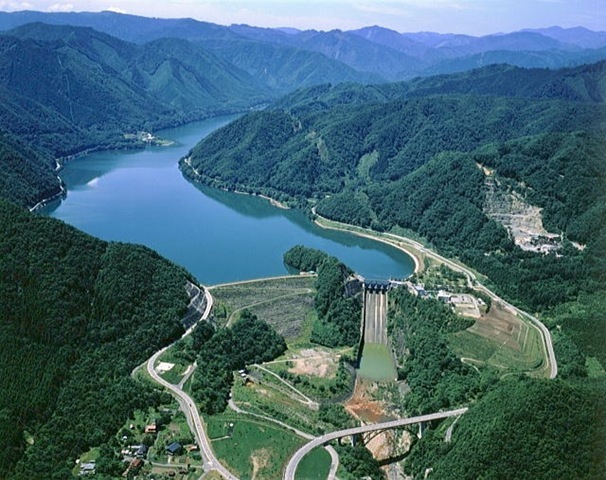 He and his friend Mr. Tatsuo Hamajima made a suggestion for the irrigation canal for facilitating agricultural development in Chita Peninsula, Aichi Prefecture, and the canal was completed in 1961. The quality of life in Chita area was improved by the Aichi Irrigation Canal, but 56 workers died by the completion. When five people died by the accident during the bypass-tunnel work, Mr. Kuno groveled in the dirt at the place in great sorrow and said the opening line. After that he prayed for the causalities every day, but never could relax his mind. One day, Mr. Kuno had a chance to spill his suffering heart to the university president of Nagoya University, Dr. Seizo Katsunuma. Dr. Katsunuma said to him, “We need teach anatomy to train doctors, but we don’t have enough bodies for it at the medical department. How about devoting your life to the movement of body donation?” Mr. Kuno signed up for the list of the donation immediately, and was saved by the action. It is the start of Furokai. Now, this is the summary of Dr. Obitsu’s speech: Our body has a kind of field of life. Its energy is life. When the life force goes down somehow, the field of life works and makes the body recovered. That is the natural healing ability. It’s not only human has. It exists in all of the fields of life. The earth is one of life. Recently the earth’s natural healing ability and life force have been going down. That’s why we have to face lots of terrible natural disasters. We have to boost up not only the field of life of ours but also of the earth. Every living thing dies one day. But the death is not the end. It’s a new start. We should enhance our energy to the new world. The death is the energy’s burst. If you live the day as the last day for your life, everything looks bright.